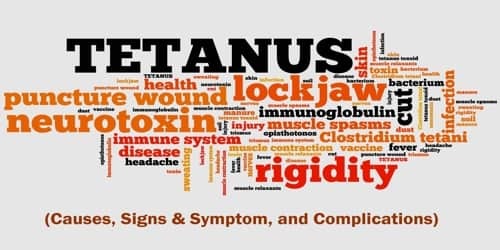 Definition: Tetanus, also known as lockjaw, is a serious disease that attacks the nervous system with the potentially deadly bacteria called Clostridium tetani. It can cause painful spasms and stiffness in our jaw muscles. These spasms usually last a few minutes each time and occur frequently for three to four weeks. Spasms may be so severe that bone fractures may occur. Symptoms may include fever, sweating, headache, trouble swallowing, high blood pressure, and a fast heart rate. The onset of symptoms is typically three to twenty-one days following infection. It may take months to recover. About ten percent of cases prove fatal. The infection can cause severe muscle spasms, serious breathing difficulties, and can ultimately be fatal. Although tetanus treatment exists, it is not uniformly effective. The best way to protect against tetanus is to take the vaccine. Causes, Sign, and Symptom of Tetanus: Tetanus is caused by the Clostridium tetani bacterium. These spores are able to survive for a long time outside of the body. They are most commonly found in animal manure and contaminated soil but may exist virtually anywhere. If the spores get into our body through an injury, burn, or wound, they release bacteria that make a poison called tetanospasmin (also called tetanus toxin). This poison blocks nerve signals from our spinal cord to our muscles, causing severe muscle stiffness and spasms, which in some cases can injure muscle tissue or cause fractures of the spine. Tetanus is not transmitted from person to person. A person usually becomes infected with tetanus when dirt enters a wound or cut. Tetanus germs are likely to grow in deep puncture wounds caused by dirty nails, knives, tools, wood splinters, and animal bites. Women face an additional risk of infection if a contaminated tool is used during childbirth or during an abortion. A newborn baby may become infected if the knife, razor, or other instrument used to cut its umbilical cord is dirty, if the dirty material is used to dress the cord, or if the hands of the person delivering the baby are not clean. Infants and children may also contract tetanus when dirty instruments are used for circumcision, scarification, and skin piercing, and when dirt, charcoal, or other unclean substances are rubbed into a wound. Tetanus is often associated with rust, especially rusty nails. Although rust itself does not cause tetanus, objects that accumulate rust are often found outdoors or in places that harbor anaerobic bacteria. Hence, stepping on a nail (rusty or not) may result in a tetanus infection, as the low-oxygen (anaerobic) environment may exist under the skin, and the puncturing object can deliver endospores to a suitable environment for growth. It is a common misconception that rust itself is the cause and that a puncture from a rust-free nail is not a risk. Signs and symptoms of tetanus appear anytime from a few days to several weeks after tetanus bacteria enter your body through a wound. The average incubation period is seven to 10 days. Even with treatment, about 10% of people who contract tetanus die. The mortality rate is higher in unvaccinated people and people over 60 years of age. Complications: If the patient does not receive treatment, the risk of life-threatening complications is higher and mortality rates vary from 40 to 76 percent. Fractures and broken bones: Intense muscle spasms can cause the spine and other bones to break. Disability: Prolonged use of strong sedatives to control muscle spasms can lead to permanent disability. Aspiration pneumonia: If secretions or contents of the stomach are inhaled, a lower respiratory tract infection can develop, leading to pneumonia. 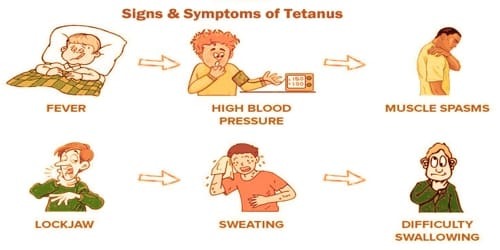 Brain damage: Since spasms can restrict oxygen, tetanus may cause lasting brain damage in infants, from minor mental deficits to more serious conditions like cerebral palsy. Severe kidney failure (acute renal failure): Severe muscle spasms can result in the destruction of skeletal muscle which can cause a muscle protein to leak into the urine. This can cause severe kidney failure. Death: Severe muscle spasms from tetanus can cause airway obstruction and the inability to breath. Respiratory failure is the most common cause of death in people with tetanus. Neonatal tetanus: This can occur in a newborn whose mother has not been immunized. Cardiac arrest may also occur from lack of oxygen, as well as pneumonia. With proper treatment, less than 15 percent of people with tetanus die. Complete recovery from a tetanus infection requires new nerve endings to grow, which can take up to several months.